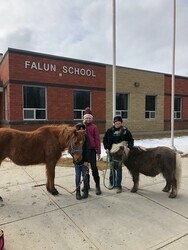 Falun School is situated thirty-six (36) kilometres west of Wetaskiwin along Highway 13 and about fourteen (14) kilometres east of Pigeon Lake. The local economy is based on mixed farming, oil field industry and tourism. Our population of students comes from a mixture of farm families, acreage dwellers and native students attending from the nearby Pigeon Lake Reserve and Louis Bull Reserve. Virtually all of our students are bussed to school.